Modern Frozen ~ Anna & Elsa go hipster! Okay, I had way too much fun playing this, lol! 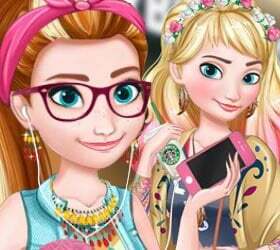 In this gorgeous make over game, you get to dress up Anna and Elsa, the princess sisters from Disney's Frozen, but with a modern fashion twist! Give the girls a full make over and adorn them in awesome hipster garb. Finally, accessorize with modern conveniences, such as Starbucks cups and iPhones. You can even give them thick rimmed glasses, hippy jewelry, fashionable hand bags and ombre hairstyles. When you're ready, hit up the mall and meet modern Merida and Rapunzel, hehe. Enjoy! The grey half-circle saving button is set up to capture both girls on the very last screen. @Starkitprophecy- I totally agree @game- I like it but not that much. I thought Kristoff was being set up for Elsa.. I thought that kind of worked. It was kind of lame when he ended up with Anna.. I didn't feel the chemistry. Not that he had any with Elsa, but I thought it could work.. She would wear the pants, but he's still capable enough to keep up with her. He would bring the warmth to the relationship etc. There are two kinds of people in this world... those who love Frozen and those who hate Frozen. Idina Menzel wants Elsa's love interest to be female, and I wholeheartedly suppport the gay queen. I don't really like Jelsa either. It just doesn't jibe with me for some reason. I can see why people DO, I just don't like it myself.